Since 2010, CRC has offered free summer camps for children in surrounding villages. These week-long sessions offer classes on environmental conservation, art and theater workshops, and lessons on playing and building traditional musical instruments. Counselors included teachers at nearby primary schools, parents of students, and other community members. This year's summer camp was funded in part by PACT (Protected Areas Conservation Trust) and focused on conserving ecosystems and indigenous cultures. 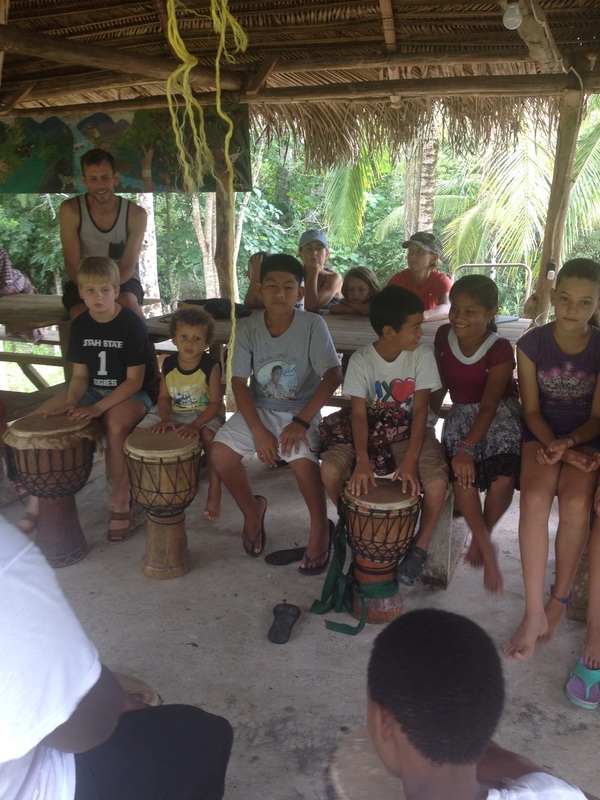 Children of Barranco and San Pedro Columbia village learned about cultural practices of the Kekchi and the Garifuna, including drumming, harp playing, and cooking classes. We also studied environmental problems and solutions by dramatizing environmental problems and solutions (see video below). Our 2012 camp was free and well attended. We did not have enough space for all the children who wanted to participate. Classes included dance/drama, painting, Maya history, sports, yoga, chess, origami, music, perfume making, soap making, and more. Thanks to the Family Foundation, Gomi, Mat, Emmeth, Dawn, Dem Dat's Doin,' and all the volunteer teachers and counselors for making it happen. Check out the environmental drama below, filmed by PGTV. This year's summer camp was in July 2011 and was sponsored by a grant from PACT (Protected Areas Conservation Trust) and with SATIM. Activities included art, drumming, environmental education, football, and a trip to Lubaantun. We also had swimming, water games, and drama. The participants in the camp were children 9-14 (mostly) from Barranco Primary School and San Pedro Columbia RC School. Counselors included teachers, parents and community members from Barranco and Columbia. Barranco participants stayed in the guesthouse and were the first group to use the newly installed upstairs and downstairs bathrooms. Check out the video below! Photos by Laura McDermot, Barranco Peace Corps volunteer. CRC's first summer session was launched on July 2010. Kids gathered under the CRC's thatch for an exciting week of educational enrichment!